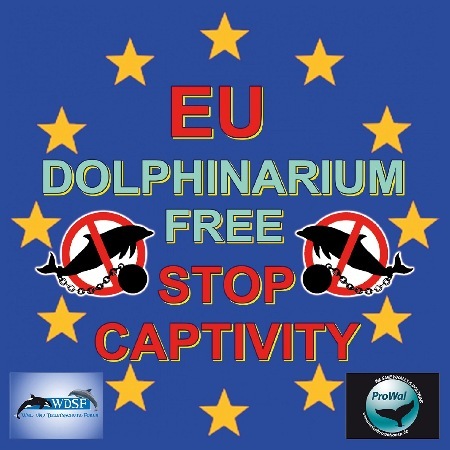 ProWal/WDSF - ONLINE-CAMPAIGN to close all 30 dolphinariums in the European Union! MEP – Please email the pre-made letter below, or write your own letter and send it to the MEPs. For the email, copy and paste the pre-made letter below into the email (or your own letter). Then simply insert the email address in to the recipient field and include a subject in the subject line. ProWal - ONLINE-KAMPAGNE zur Schließung aller 30 Show-Delfinarien in der Europäischen Union! Bitte senden Sie den EU-Parlamentariern eine E-Mail in englischer Sprache. Einen Text-Entwurf und alle E-Mail-Adressen der EU-Parlamentarier ersehen Sie folgend. Einfach den ganzen Adressen-Block markieren, kopieren und in das Empfängerfeld einfügen und noch einen eigenen Betreff in die Betreffzeile schreiben. I would like to personally draw your attention to an urgent matter. You are almost certainly aware that there are currently 30 show dolphinariums in 13 countries of the European Union, in which more than 300 marine mammals are kept in a manner which is not appropriate for the species. Mainly Bootlenose dolphins, but also Orcas (France/Spain), Beluga whales (Spain), Harbour porpoises (Holland) and an Amazonian river Dolphin (Germany) are kept in these facilities. Many European citizens oppose these dolphin prisons and it is also noticeable that protest campaigns demanding the closure of these facilities are on the increase. In UK, all dolphinariums have been closed after criticism from animal rights activists. Likewise, there is fierce resistance to plans for new dolphinariums in the EU, which is also political. Of course the statutory regulation about keeping dolphins in dolphinariums is mainly a matter for individual member states of the EU. Cyprus and Slovenia have totally forbidden the keeping of dolphins for commercial reasons. Nevertheless, the European Union has a responsibility to protect the marine mammals and the possibility of making an important contribution to ending the captivity of dolphins and whales. I would now like to give you some background information as to why I am also against the captivity of dolphins. All show dolphinariums merged a few years ago and are organised under the ominous European Endangered Species Programme (EEP) for dolphins (Tursiops truncatus). Mainly commercial recreation parks are found in this organisation, with Zoo members being the exception. In 2010, the German federal government announced that dolphins will be listed in a stud book. This stud book includes all animals which are kept in European dolphinariums, as well as outside the EU. The EEP does not disclose which dolphinariums are members outside the EU and within Europe. In Europe, there are still dolphinariums in the Ukraine and Russia, both countries are importers of wild dolphins which have been caught in Taiji, Japan! The stud book is treated as a state secret by the EEP, any request for disclosure or inspection is refused. No one, not even governments, are allowed to see! Of course there are reasons for this lack of transparency. The dolphinariums in the EU are connected to the wild dolphins caught during the cruel and brutal hunts in Japan! In the past, SeaWorld in the US bought wild dolphins caught in Japan and started its own breeding programme. The Dutch dolphinarium in Harderwijk bought dolphins from SeaWorld/USA. To this day the EEP doesn’t disclose which dolphins it concerns. In 1979 three dolphins were bought by a German zoo in Japan and imported to Germany. A dolphin died in 1990. The whereabouts of the other three dolphins is unaccounted for to this day. Even the EEP has no information about this. In 2013 a circus operator in Prague tried to import dolphins from the Ukraine to the Czech Republic. Since there was limited breeding success of dolphins in the Ukraine, these dolphins either originated from illegal catches in the Black Sea or were purchased from Japan. The importing of dolphins of dubious origin into the EU could be hindered by the interventions of PETA in Prague and ProWal at the responsible environmental ministry in Kiev. A ProWal/WDSF survey in 2014 of all dolphinariums in the EU in accordance with DNA analysis data drew no results. On this occasion all the dolphinariums refused to collaborate or allow the inspection of already available data, which of course provided deep insight! An impenetrable dolphin carousel exists in the EU! Dolphins are continually torn from their social structure and passed to and fro between the dolphinariums in the EU for breeding purposes. For instance, the dolphin Anke had already been transferred for the sixth time in her life between countries. After another still birth, Anke was brought from Holland to the German zoo in Nuremberg, to try for offspring there. It took several hours to catch Anke. In the process dolphins injure their fins, tails, flippers and behind the blow hole. The dolphins are sedated with the psychotropic Diazepam. This type of information is only obtainable when the individual documents are inspected. However, most EEP members do not allow this. There are no special regulators who control the EEP. After nearly 50 years of breeding attempts there are only a few dolphins in the EU which have been born in the 2nd generation and still live. Surplus male dolphins, who are no longer needed for breeding, are likewise victims. They are kept in groups, in which there are no female dolphins, for instance in dolphinariums in Malaga. It is the purest form of animal cruelty to prevent dolphins from living out their natural sexual lives! In many dolphinariums it is also the norm to give female dolphins contraceptive medication. However, sustained dosage poses a health risk. Tumours caused through this were noticed in other animal species. The dolphins should not be kept in captivity in this way, so that they are able to live out their natural and biological behaviour. The reasons given by the dolphinarium industry about animal protection, breeding, development and research are pure alibis. Dolphinariums are still run today in the EU for purely commercial reasons. The EEP does not contribute to the protection of species. Not a single dolphin was returned to the wild from the dolphinariums in the EU. The EEP has no official mandate for dolphins and is not only superfluous and inappropriate for the times, but has absolutely no right to exist! After intervention by animal rights activists the Ukraine was the first country in the world to pass a law in 2015, which prescribes the use of sea water in dolphinariums. The Ukrainian Parliament (Rada) and the president of the Ukraine, Petro Poroschenko, have sent out an important signal with this law, which the EU should see as a role model. This passage is a significant measure, which is aimed at the protection of dolphins from animal cruelty. It sets an example for the EU and for other countries in which marine mammals are kept in captivity! There are many scientific studies which oppose the enrichment of water in dolphinariums with chlorine or ozone. - Dolphins' eyes and skin irritation. Prolonged exposure to chlorinated water may result in negative health effects. Over time dolphin's skin becomes gradually discoloured; it ruptures and develops large white spots. Chlorinated water also causes diseases in seals and sea lions. Skin infections contracted by sea mammals, in chlorinated water, can be the result of ruined beneficial microflora and inactivation of antimicrobial agents excreted by the skin (Geraci, St. Aubin, and Hicks). Dolphins suffer from eye problems involving a thin protective layer that covers the cornea; some dolphins start secreting large amounts of mucus around their eyes as a defence mechanism. Excessive use of chlorine can cause eye burns. Dyeing the pool in blue colour leads to its excessive illumination and, along with exposing the eyes to direct sun light when performing tricks, causes cataracts and corneal diseases. - Use of chlorine creates problems similar to those caused by carcinogenic substances. The effect of chlorine and its by-products is unfit for sea mammals. Departure from the natural habitat conditions begins with changing the pH level from that of the sea to that of a man-made pool. Majority of facilities keeping sea mammals maintain the pH level of 7.6 to 7.8, whereas a much higher than 8.3 pH level is typical of the ocean (studies by Jason Dombrosky (West Edmonton Mall - Dolphin Lagoon, Edmonton, Alberta, Canada)). - Chlorination of water prevents dolphins from using certain types of communication. Dolphins release signalling agents, or pheromones, needed for their social and sexual behaviour into the water. These agents are destroyed by chlorine (research studies by Herman and Tavolga). - Respiratory diseases. Dolphins were observed to develop inflammation around the spiracle, airways and bronchial inflammation. Chlorine gas in concentrations of 10 parts per million causes significant irritation of airways, while even 1 part can be lethal if breathed for 5 minutes (Goodman and Gilman). - Combined with chlorine, animal faeces form substances irritating their skin and eyes. Ozone is potentially toxic and can cause irritation to eyes, skin, and the respiratory system; therefore, it should be used with utmost care to avoid the risk to staff and animals. Ozone, being an effective bactericidal agent and a powerful oxidant, is unstable in water. It also acts as a discolouring agent by attacking carbon double bonds and removing colour pigments (Toorn 1987). Ozone is more effective than chlorine against faecal bacteria Escherichia coli, plankton, insects, and, possibly, viruses. However, the effectiveness of ozone decreases in water with a high density of microorganisms or higher suspended materials concentration. Unlike chlorine, ozone does not leave residual disinfectants in the water environment if the oxidation potential in the feed point is maintained at a level lower than 600 millivolts (Reidarson 2003). Higher concentrations of ozone can also cause damage to cornea, skin, and airways (the same reference). I would like to sincerely ask you to support the protection of sea mammals and support an EU law which obliges all dolphinariums in the European Union to use sea water in their facilities. You have the means and instruments for this! With this type of law, the European Union, in addition to the Ukraine, would also act as a global model, which takes the protection of sea mammals seriously and also actually puts it into practice. Of course, it is foreseeable that some inland dolphinariums cannot implement this criteria for logistical and financial reasons and must hand over their dolphins to other dolphinariums. There is, of course, an excess of dolphins in the dolphinariums in the EU, which have to be accommodated in manner appropriate to the species. However, there are solutions for this. The dolphinariums in the EU can finance and implement a project, in which dolphins can be kept in one or several bays supervised by people. I would like to thank you for taking the time to read my letter and I really hope you address this issue and support an EU law to protect dolphins. ich möchte mich mit einem dringenden Anliegen an Sie persönlich wenden. Sicherlich ist Ihnen bekannt, dass sich in der Europäischen Union derzeit in 14 Ländern 30 Show-Delfinarien befinden, in denen mehr als 300 Meeressäuger nicht artgerecht gehalten werden. Überwiegend werden in diesen Anlagen Große Tümmler, aber auch Orcas (Frankreich/Spanien), Beluga-Wale (Spanien), Hafenschweinswale (Holland) und ein Amazonas Fluss-Delfin (Deutschland) in Gefangenschaft gehalten. Europaweit ist die Ablehnung der Bürger gegenüber diesen Delfingefängnissen sehr groß, was auch daran erkennbar ist, dass es immer mehr Protestaktionen mit der Forderung zur Schließung dieser Anlagen gibt. In England wurden nach der Kritik von Tierschützern alle Delfinarien geschlossen. Gegen Pläne von neuen Delfinarien in der EU gibt es ebenfalls massive Widerstände, auch seitens der Politik. Erst Ende August 2015 hat der polnische Umweltminister Maciej Grabowski Überlegungen zum Bau eines Delfinariums in Polen eine Absage erteilt. "Ich bin dafür, Delfine ausschließlich in ihrer natürlichen Umgebung zu bewundern. Jedes neu gebaute Delfinarium habe negativen Einfluss auf die wild lebenden Delfine, weil die Zahl der in Gefangenschaft geborenen Tiere nicht dem Bedarf der Delfinarien entspreche. Als Umweltminister könne er dem Fang wilder Delfine nicht zustimmen." Sicherlich ist die gesetzliche Regelung über die Haltung von Delfinen in Delfinarien hauptsächlich eine Angelegenheit der einzelnen Mitgliedsländer der EU. Zypern und Slowenien haben die Haltung von Delfinen für kommerzielle Zwecke gänzlich verboten. Dennoch hat auch die Europäische Union eine Verantwortung zum Schutz der Meeressäuger zu tragen und Möglichkeiten, einen wichtigen Beitrag für die Beendigung der Gefangenschaftshaltung von Delfinen und Walen zu leisten! Ich möchte Ihnen nun folgend einige Hintergrund-Informationen geben, warum auch ich gegen die Haltung von Delfinen in Gefangenschaft bin. Alle Show-Delfinarien haben sich vor einigen Jahren zusammengeschlossen und sind in dem ominösen Europäischen Erhaltungszuchtprogramm (EEP) für Delfine (Tursiops truncatus) organisiert. In diesem Zusammenschluss befinden sich überwiegend kommerzielle Freizeitparks. Zoo-Mitglieder sind dabei die Ausnahmen. Wie die deutsche Bundesregierung in 2010 bekannt gab, werden die Großen Tümmler in einem Zuchtbuch aufgeführt. Dieses Zuchtbuch erfasst alle Tiere, die in europäischen Delfinarien, also auch außerhalb der EU, gehalten werden. Um welche Delfinarien es sich außerhalb der EU und innerhalb Europas handelt, wird vom EEP verschwiegen. In Europa gibt es nur noch Delfinarien in der Ukraine und in Russland. Beide Länder sind Importeure von wildgefangenen Delfinen aus Taiji/Japan! Das Zuchtbuch wird vom EEP wie ein Staatsgeheimnis behandelt. Jegliche Forderung nach Offenlegung oder Einsichtnahme wird verweigert. Kein Außenstehender, nicht einmal Regierungen, erhalten darin einen Einblick! Diese Intransparenz hat wohl Gründe! Es gibt Verbindungen der Delfinarien in der EU zu wildgefangenen Delfinen aus den grausamen und brutalen Treibjagden in Japan! SeaWorld in den USA kaufte in der Vergangenheit wildgefangene Delfine in Japan und startete ein eigenes Zuchtprogramm. Das holländische Delfinarium in Harderwijk kaufte Delfine von SeaWorld/USA. Bis heute verschweigt das EEP um welche Delfine es sich dabei handelte! 1979 wurden von einem deutschen Zoo drei Delfine in Japan gekauft und nach Deutschland importiert. Ein Delfin starb 1990. Der Verbleib der anderen beiden Delfine ist bis heute ungeklärt! Auch darüber gibt das EEP keine Auskunft! In 2013 gab es einen Versuch von einem Zirkusbetreiber in Prag, Delfine aus der Ukraine nach Tschechien zu importieren. Da es kaum Zuchterfolge von Delfinen in der Ukraine gab, stammten diese Delfine entweder von illegalen Fängen aus dem Schwarzen Meer oder waren Käufe aus Japan. Durch Interventionen von PETA in Prag und ProWal beim zuständigen Umweltministerium in Kiew konnte dieser Import von Delfinen mit dubioser Herkunft in die EU verhindert werden! Eine ProWal/WDSF-Anfrage in 2014 bei allen Delfinarien in der EU nach DNA-Analyse-Daten blieb ergebnislos. Alle Delfinarien verweigerten hierbei eine Zusammenarbeit oder die Einsichtnahme in schon vorhandenen Daten, was natürlich tief blicken lässt! In der EU besteht ein undurchschaubares Delfin-Karussell! Für Zuchtzwecke werden Delfine ständig aus ihrem Sozialgefüge gerissen und quer durch die EU zwischen den Delfinarien hin- und hergeschoben. Beispielsweise wurde der Delfin Anke schon zum sechsten Mal in seinem Leben zwischen Ländern transferiert. Nach einer weiteren Totgeburt wurde Anke von Holland in den deutschen Zoo nach Nürnberg gebracht, um dort für Nachwuchs zu sorgen. Mehrere Stunden dauerte die Fangaktion von Anke. Dabei verletzte sich der Delfin an Finne, Fluke, Flipper und hinter dem Blasloch. Ruhiggestellt wurde der Delfine mit dem Psychopharmakon Diazepam. Solche Informationen sind nur erhältlich, wenn es Einsichten in die eigenen Unterlagen gibt, die jedoch von den meisten EEP-Mitgliedern verweigert werden. Es gibt keine spezielle Aufsichtsbehörde, die das EEP kontrolliert. Nach fast 50 Jahren Zuchtbemühungen gibt es nur wenige Delfine in der EU, die in 2. Generation geboren sind und noch leben. Überschüssige männliche Delfine, die zur Zucht nicht mehr gebraucht werden, sind ebenfalls die Leidtragenden. Sie werden in Gruppen gehalten, in denen es überhaupt keine weiblichen Delfine gibt, wie zum Beispiel im Delfinarium in Malaga. Es ist reine Tierquälerei, wenn Delfine an ihrem Ausleben ihres natürlichen Sexuallebens gehindert werden! In vielen Delfinarien ist es üblich, dass den weiblichen Delfinen auch empfängnisverhütende Medikamente verabreicht werden. Eine Dauerverabreichung stellt jedoch ein gesundheitliches Risiko dar. Bei anderen Tierarten wurden dadurch verursachte Tumore festgestellt! Die Delfine können in Gefangenschaft nicht so gehalten werden, damit sie ihre natürlichen und biologischen Verhaltensweisen ausleben können. Die vorgeschobenen Gründe der Delfinarien-Industrie für den Artenschutz, die Zucht, der Bildung und der Forschung sind reine Alibis! Der einzige Grund, warum heute in der EU überhaupt noch Delfinarien betrieben werden, sind überwiegend kommerzielle Interessen! Zum Artenschutz trägt das EEP nicht bei. Kein einziger Delfin wurde von den Delfinarien in der EU wieder ausgewildert. Das EEP für Delfine hat keinen offiziellen Auftrag und ist nicht nur überflüssig und nicht mehr zeitgemäß, sondern hat überhaupt keine Existenzberechtigung! Nach Interventionen von Tierschützern hat die Ukraine als erstes Land der Welt 2015 ein Gesetz verabschiedet, welches die Nutzung von Meerwasser in den Delfinarien vorschreibt! Das Parlament der Ukraine (Rada) und der Präsident der Ukraine, Petro Poroschenko, haben mit diesem Gesetz ein wichtiges Zeichen gesetzt, welches sich die EU als Vorbild auch zu Herzen nehmen sollte! Dieser Passus ist eine signifikante Maßnahme, die auf den Schutz der Delfine vor Tierquälerei ausgerichtet ist! Er hat Vorbild-Charakter für die EU und auch für andere Länder, in denen Meeressäugetiere in Gefangenschaft gehalten werden! es gibt viele wissenschaftliche Studien die sich gegen die Anreicherung des Wassers in Delfinarien mit Chlor oder Ozon in den Delfinarien beschäftigt haben. Reizung der Augen und Haut der Delfine. Längerer Kontakt mit chlorhaltigem Wasser kann negative Auswirkungen auf die Gesundheit haben. Mit der Zeit verfärbt sich die Haut des Delfins; sie platzt und entwickelt große weiße Flecken. Hautinfektionen, die sich Meeressäuger in chloriertem Wasser zuziehen, können das Ergebnis zerstörter gesunder Mikroflora und Inaktivierung von antimikrobiellen Wirkstoffen, die von der Haut abgeschieden werden, sein (Geraci, St. Aubin und Hicks). Delfine leiden an Augenproblemen unter Beteiligung einer dünnen Schutzschicht, die die Hornhaut bedeckt; einige Delfine beginnen, als Verteidigungsmechanismus, große Mengen Schleim rund um ihre Augen abzuscheiden. Übermäßige Verwendung von Chlor kann Augenverätzungen verursachen. Blaufärbung des Pools führt zu seiner übermäßigen Beleuchtung und verursacht zusammen mit der Exposition der Augen zu direkter Sonnenbestrahlung bei Vorführung von Tricks Katarakte und Hornhauterkrankungen. Die Verwendung von Chlor schafft ähnliche Probleme wie die durch karzinogene Stoffe verursachten Probleme. Die Wirkung von Chlor und seiner Nebenprodukte ist für Meeressäuger untauglich. Abweichungen von den natürlichen Lebensraumbedingungen beginnen mit der Änderung des pH-Werts gegenüber dem des Meeres zu dem in einem von Menschenhand geschaffenen Pools. Die Mehrzahl der Einrichtungen, die Meeressäuger halten, halten den pH-Wert auf 7,6 bis 7,8, während ein weitaus höherer ph-Wert typisch für den Ozean ist (Untersuchungen von Jason Dombrosky (West Edmonton Mall - Dolphin Lagoon, Edmonton, Alberta, Kanada)). Chlorierung des Wassers verhindert, dass Delfine bestimmte Arten von Kommunikation nutzen können. Delfine setzen Botenstoffe bzw. Pheromone, die für ihr soziales und sexuelles Verhalten benötigt werden, im Wasser frei. Diese Stoffe werden durch Chlor zerstört (Forschungsstudien von Herman und Tavolga). Atemwegserkrankungen. Es wurde beobachtet, dass Delfine Entzündungen rund um das Atemloch, die Atemwege und bronchiale Entzündungen entwickeln. Chlorgas in Konzentrationen von 10 Teilen pro Million verursacht signifikante Reizung von Atemwegen, während selbst 1 Teil tödlich sein kann, wenn er 5 Minuten lang eingeatmet wird (Goodman und Gilman). Kombiniert mit Chlor bilden tierische Fäkalien Stoffe, welche ihre Haut und Augen reizen. Ozon ist potenziell toxisch und kann Reizungen an Augen, Haut und an den Atemwegen verursachen. Daher sollte es mit äußerster Sorgfalt verwendet werden, um Gefahren für Angestellte und Tiere zu vermeiden. Ozon, das ein wirksames keimtötendes Mittel und ein leistungsfähiges Oxidationsmittel ist, ist in Wasser instabil. Es wirkt ebenfalls als Entfärbungsmittel, indem es die Doppelbindungen von Kohlenstoff angreift und Farbpigmente entfernt (Toorn 1987). Ozon ist wirksamer als Chlor gegen fäkale Bakterien, Escherichia coli, Plankton, Insekten und möglicherweise Viren. Die Wirksamkeit von Ozon verringert sich jedoch im Wasser mit hoher Dichte an Mikroorganismen oder höherer Konzentration an Schwebstoffen. Anders als Chlor hinterlässt Ozon keine Desinfektionsmittelreste im Wasser, wenn das Oxidationspotenzial in der Einspeisestelle auf einem Wert unter 600 Millivolt gehalten wird (Reidarson 2003). Höhere Konzentrationen von Ozon können ebenfalls Schäden an Hornhaut, Haut und Atemwegen verursachen (die gleiche Referenz). ich möchte Sie inständig darum bitten, sich für den Schutz der Meeressäuger einzusetzen und sich für ein EU-Gesetz einzubringen, dass alle Delfinarien in der Europäischen Union dazu verpflichtet, ebenfalls Meerwasser in ihren Anlagen zu verwenden! Die Möglichkeit und das Instrument dafür haben Sie! Mit einem solchen Gesetz würde, neben der Ukraine, auch die Europäische Union als ein weltweites Vorbild fungieren, welches den Schutz der Meeressäuger ernst nimmt und ihn auch tatsächlich praktiziert! Natürlich ist es absehbar, dass einige Inlands-Delfinarien dieses Kriterium aus logistischen und finanziellen Gründen nicht umsetzen können und ihre Delfine an andere Delfinarien abgeben müssten. Es gäbe wohl einen Überschuss an Delfinen in den Delfinarien in der EU, die artgerechter untergebracht werden müssten, für das es aber Lösungen gibt. Die Delfinarien in der EU können ein Projekt finanzieren und umsetzen, in dem Delfine in einer oder mehreren von Menschen betreuten Meeresbuchten untergebracht werden können! Ich möchte mich dafür bedanken, dass Sie sich die Zeit für das Lesen meines Briefes an Sie genommen haben und ich wünsche mir sehr, dass Sie sich auch diesem Thema annehmen und sich für ein EU-Gesetz zum Schutz der Delfine einsetzen.